What is subthalamic nucleus deep brain stimulation? What are the advantages of deep brain stimulation? What kinds of movement problems are helped by deep brain stimulation? Is deep brain stimulation experimental? Is age a factor in deep brain stimulation? Where should deep brain stimulation be performed? Will I be asleep during the deep brain stimulation procedure? What should I expect after deep brain stimulation? When will I be able to go home after the deep brain stimulation procedure? Will I have to limit activity following deep brain stimulation surgery? Can I use electrical devices? 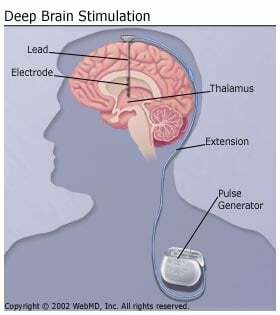 In deep brain stimulation electrodes are connected by wires to a type of pacemaker device (called an impulse generator, or IPG) implanted under the skin of the chest, below the collarbone. Once activated, the device sends continuous electrical pulses to the target areas in the brain, blocking the impulses that cause tremors. This has the same effect as thalamotomy or pallidotomy surgeries without actually destroying parts of the brain. The IPG can easily be programmed using a computer that sends radio signals to the device. Patients are given special magnets or other devices so they can externally turn the IPG on or off. Experts are unclear how deep brain stimulation works. Patients who are having stimulators placed on both sides of the brain will have their surgery divided into two parts. Most people with Parkinson's disease will require the surgery be done on both sides of the brain. During the first surgery, the electrodes are placed into the brain, but left unconnected. There are several ways in which the electrodes are placed into the target areas of the brain. First these areas must be located. One way to locate the target areas is to rely only on a computed tomography (CT) or magnetic resonance imaging (MRI) scan. While some surgeons stop there, others use an electrode recording technique to map and target the specific areas that they will need to reach. Once the correct location is identified, the permanent electrodes are implanted. The loose ends are placed underneath the skin of the head and the incision is closed with sutures. The patient receives general anesthesia for the placement of the impulse generator in the chest and the positioning of extension wires that connect the electrodes to the impulse generators. It may take a few weeks until the simulators and medications are adjusted sufficiently for patients receive adequate symptom relief. But, overall, DBS causes very few side effects. Subthalamic nucleus stimulation is a new application of the original deep brain stimulation technique. After extensive clinical trials, stimulation of the part of the brain called the subthalamic nucleus has been recognized as the most effective surgical treatment for Parkinson's disease, addressing not only tremors, but the full range of the disease's symptoms, including: rigidity, slowness of movement, stiffness, and walking concerns. Successful stimulation of the subthalamic nucleus allows patients to consistently reduce their medication while improving all of their other disease-related symptoms. In addition, the surgery to place the stimulator in the subthalamic nucleus is generally easier than surgeries for the thalamus or globus pallidus. Deep brain stimulation has many advantages. First, it does not require purposeful destruction of any part of the brain and therefore, has fewer complications than thalamotomy and pallidotomy. In addition, the electrical stimulation is adjustable and can be changed as the person's disease changes or his or her response to medications change. No further surgery is necessary to make the adjustments. Another significant advantage of deep brain stimulation relates to future treatments. Destructive surgery, such as thalamotomy or pallidotomy, may reduce the person's potential to benefit from future therapies. For example, future brain cell transplantation may be of great help to people with Parkinson's disease. There is concern that a pallidotomy or thalamotomy may prevent patients from benefiting from brain cell transplantation. This would not be the case with deep brain stimulation, as the stimulator could be turned off. Deep brain stimulation is a relatively safe procedure. The procedure can treat all the major symptoms of Parkinson's disease. Daily living tasks and quality of life are also improved. With subthalamic nucleus stimulation, medications can usually be reduced. The stimulator can also be turned off at any time if deep brain stimulation is causing excessive side effects. Increased risk of infection. The implantation of any foreign object in the body carries that risk. Additional surgery may be needed if the equipment stops working or for battery replacement. Additional time on the part of the patient and health care provider to program device and adjust medications. Device may interfere with anti-theft devices, refrigerator door magnets. With deep brain stimulation, the vast majority of people (over 70%) experience a significant improvement of all their symptoms related to Parkinson's disease. Most people are able to significantly reduce their medications. Deep brain stimulation of the subthalamic nucleus is effective for all major symptoms of Parkinson's disease, such as tremor, slowness of movement, rigidity, and problems with walking and balance. People bothered by involuntary movements such as dyskinesia often experience a marked reduction of these involuntary movements primarily because they are able to reduce their medications following surgery. Deep brain stimulation of the globus pallidus is effective for a wide range of Parkinson's symptoms. It seems to be somewhat less effective for problems with walking and balance. Also, patients remain on the same average dose of medications following surgery. Deep brain stimulation of the thalamus is only effective for tremor and rigidity. Consequently, deep brain stimulation of the thalamus is usually not performed for patients with Parkinson's disease. As with any surgical procedure, there are risks. There is a 2%-3% risk of a serious and permanent complication such as paralysis, changes in thinking, memory and personality, seizures, and infection. Talk to your doctor to see if these risks apply to you. No. Deep brain stimulation is not experimental. DBS of the thalamus was approved by the FDA for the treatment of Parkinson's disease and essential tremor in 1997. But, since stimulation of the thalamus is only effective for treating tremor and rigidity symptoms, it is not recommended for the treatment of Parkinson's disease. This is because even if a person currently only has tremor or rigidity, he or she will eventually develop other symptoms that would only be helped by stimulation of the subthalamic nucleus or globus pallidus. Therefore, stimulation of the subthalamic nucleus or globus pallidus is recommended. There are many important issues to be addressed when considering deep brain stimulation. These issues should be discussed with a movement disorders expert or a specially trained neurologist. A movement disorders expert is someone who has trained specifically in movement disorders. One of the most important criteria is that the person has had an adequate trial of medications. Surgery is not recommended if medications can adequately control the disease. However, surgery should be considered for people who do not achieve satisfactory control with drugs. Talk to your doctor to see if DBS is right for you. Deep brain stimulation has been successful in treating people of different ages. However, each person should be assessed individually as to their stamina and overall health before considering surgery. Where Should the Procedure be Performed? The first and most important recommendation is that the deep brain stimulation procedure be performed in a place where there is a multi-disciplinary team of experts. This means neurologists, neurosurgeons, and neurophysiologists who have experience and specialized training in performing these types of surgeries. The next important consideration is how the surgery is done. Different centers may perform the procedure in different ways. It is very important to ask how the target (the thalamus or globus pallidus) is targeted. It is clear that the chances of benefit and the risks of complications are directly related to how close the electrode is to the correct target. You will remain awake during most of the deep brain stimulation procedure. This allows the surgical team to interact with you when testing the effects of the stimulation. Small amounts of local anesthetic (pain-relieving medication) are given in sensitive areas. The vast majority of people experience minimal discomfort during the procedure. You may feel tired and sore but will be given medication and kept comfortable after your deep brain stimulation procedure. Also, you may have irritation or soreness around the stitches and pin sites. The average hospital stay for the first part of the deep brain stimulation surgery is two to three days. For the second part of the surgery one week later, you will be in the hospital for less than 24 hours. Each of the pin sites should be kept covered with band-aids until they are dry. These should be changed every day as necessary. You should not engage in heavy activities for four to six weeks after surgery. This includes jogging, swimming, or any physical education classes. Anything strenuous should be avoided to allow your surgical wound to heal properly. If you have any questions about activities, call your doctor before performing them. Some devices, such as theft detectors and screening devices, like those found in airports, department stores and public libraries, can cause your neurotransmitter to switch on or off. Usually, this only causes an uncomfortable sensation. However, your symptoms could get worse suddenly. Always carry the identification card given to you. With this, you may request assistance to bypass those devices. You will be able to use home appliances, computers, and cell phones. They do not usually interfere with your implanted stimulator.